Congress candidate Sowmya Reddy won the Jayanagar election by 2,889 votes. She received 54,457 votes, while BJP's BN Prahlad got 51,568 votes. However, the Election Commission has not confirmed the figures yet. "Congratulations to our candidate @Sowmyareddyr for winning the Jayanagar Assembly election," the Karnataka Congress tweeted. "With this victory, @INCKarnataka has MLAs in 15 of the 28 Assembly seats of Bengaluru." Congress candidate Sowmya Reddy's lead continues to shrink. She is now ahead by only 4,849 votes at the end of round 15 of counting in the Jayanagar Assembly election. Just four rounds earlier, she was leading by nearly 12,781 votes. Unfazed by the drop in Sowmya Reddy's lead, Congress workers continue to celebrate. Congress candidate Sowmya Reddy's lead over the BJP's BN Prahlad drops to 8,614 votes at the end of round 13. The Congress got 48,584 votes, BJP 39,970 votes and independent candidate Ravikrishna Reddy, 1,451. 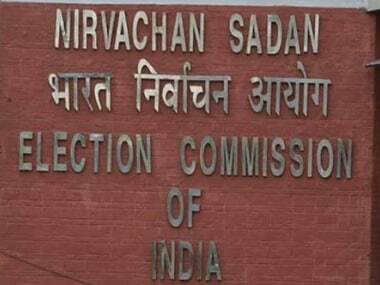 The 11th round of voting in the Jayanagar Assembly election found that 506 none of the above (NOTA) votes were registered, reports The Times of India. At the end of the 11th round of counting, Congress candidate Sowmya Reddy leads by 12,781 votes in the Jayanagar Assembly election. The former Home Minister's daughter got 43,476 votes, while her BJP rival BN Prahlad got 30,695 votes. 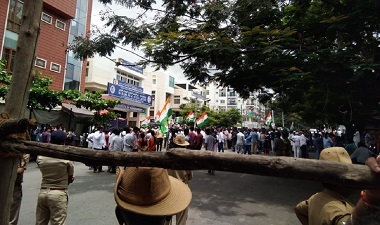 Party workers armed with the Congress flag celebrate outside the counting centre as candidate Sowmya Reddy cements her lead. The BJP candidate in the Jayanagar Assembly election, BN Prahlad, has reached the counting centre, reports The Times of India. With Congress candidate Sowmya Reddy's significant lead over the BJP, party workers have begun celebrating their imminent victory. In the eighth round of counting, it was found that 361 voters chose the none of the above (NOTA) option, reports The Times of India. Congress candidate Sowmya Reddy leads over BJP's BN Prahlad by 10,205 votes after the eighth round of counting. After the seventh round of counting, Congress candidate Sowmya Reddy leads by 7,373 votes in the Jayanagar Assembly election. She received 27,195 votes as against her nearest rival Prahlad Babu of BJP, who got 19,827 votes. Independent candidate Ravi Krishna Reddy received 766 votes. 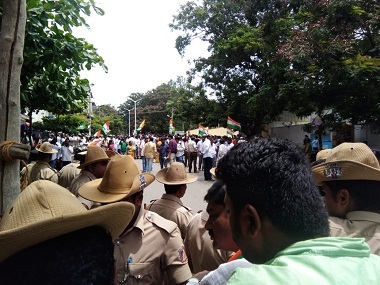 There is quite a traffic jam outside the Jayanagar counting centre in Bengaluru as Congress and BJP leaders have gathered there, reports The Times of India. The police had increased security around the centre early on Wednesday. Congress candidate Sowmya Reddy leads over BJP's BN Prahlad by 5348 votes in Jayanagar assembly constituency after round 4 of counting. BJP's B N Prahlad, brother of Vijayakumar, and senior Congress leader and former minister Ramalinga Reddy's daughter Sowmya Reddy were locked in a direct contest for the seat. In all, nineteen candidates were in the fray. Ahead of polls, Janata Dal(S) had on 5 June pulled out its candidate from the contest and extended the party's support to its ruling coalition partner, the Congress. Police have made elaborate security arrangement in and around the counting centre. An estimated 55 percent polling was recorded in the constituency on 11 June. BJP's B N Prahlad, brother of Vijayakumar, and senior Congress leader and former minister Ramalinga Reddy's daughter Sowmya Reddy were locked in a direct contest for the seat. In all, nineteen candidates were in the fray. Counting of votes has begun for Jayanagar Assembly constituency in Bengaluru, where election was held on 11 June. 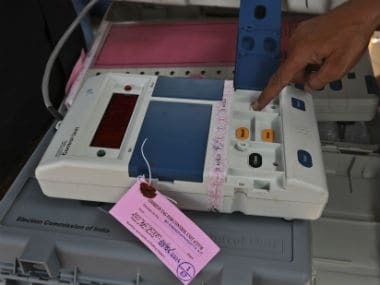 The Assembly elections were held across Karnataka on 12 May, but poll in Jayanagar was countermanded following the death of BJP candidate B N Vijayakumar, who was holding the seat. "After the victory in RR Nagar, this is yet another indication of people's faith in our party," DK Shivakumar tweeted. "Thank you to the voters of Jayanagar for supporting the Congress and defeating BJP." KJ George expressed his "heartiest congratulations" and said the Congress now has 15 of the 28 seats in Bengaluru. In addition to troops of the Karnataka State Reserve Police, three assistant commissioners of police, six inspectors, 15 sub-inspectors, 27 assistant sub-inspectors and 150 other police officers have been deployed around the counting centre to ensure an incident-free day. Congress National Secretary Madhu Goud Yaskhi congratulated Sowmya Reddy for her Jayanagar win. "I am confident #WeShallWin," he tweeted. Congress workers celebrate Sowmya Reddy's win outside the counting centre at SSMRV college in Jayanagar. The Dehradun Congress tweeted its "heartiest congratulations" to Sowmya Reddy for her victory in Jayanagar. Congress candidate Sowmya Reddy thanked her supporters and family after winning the Jayanagar Assembly election. Congratulations to our candidate @Sowmyareddyr for winning the #Jayanagar Assembly election. Congress candidate Sowmya Reddy defeats BJP's BN Prahlad by 2,889 votes to win the Jayanagar Assembly election, say reports. There are conflicting reports coming in that Congress candidate Sowmya Reddy has won the Jayanagar election by over 4,000 votes. #Jayanagar | At the end of 13th round Congress lead drops to 8,614 votes. Overjoyed by Sowmya Reddy's significant lead, Congress workers continue to celebrate outside the Jayanagar counting centre. Congress workers are amping up their celebrations outside the Jayanagar counting centre. The police have deployed additional security. #Jayanagar | Congress candidate #SoumyaReddy has secured 43,476 votes after the 11th round of counting, as against 30,695 votes secured by BJP candidate #PrahladBabu. The Congress' now leads by 12,781 votes. 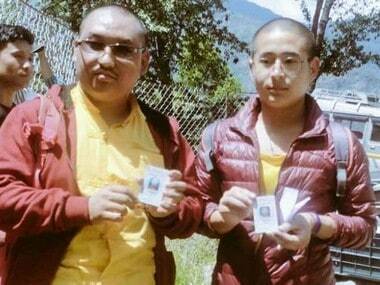 The Congress candidate has taken a lead of 15,000 votes in the ninth round of counting. #Jayanagar Election Results -- Congress candidate Sowmya Reddy is leading BJP's BN Prahlad by 15,000 votes in Jayanagar assembly constituency after round 9 of counting. Jayanagar Assembly Election 2018 Latest Updates: With a decent win in Jayanagar, coalition partner Congress has maintained its leadership position in Bengaluru. With this, the Congress has won 15 of the 28 seats in the IT city. Voting in Jayanagar was cancelled after the sitting MLA, BJP candidate BN Vijayakumar, died a few days before the election. Congress stalwart R Ramalinga Reddy's daughter Sowmya Reddy has wrested the Jayanagar seat back after 10 years from the BJP. Reddy took an early lead as counting began in Bengaluru in the morning, but her lead shrank after 15 rounds. Reddy defeated BJP's BN Prahlad by 2,889 votes. The Karnataka Assembly elections were held across on 12 May, but the Jayanagar election was countermanded to 11 June after Vijayakumar's death. The BJP then fielded his brother Prahlad. The Jayanagar election saw a voter turnout of 55 percent. In all, 19 candidates contested the election. Ahead of the polls, the Janata Dal (Secular) had witghdrawn its candidate to extend its support to the Congress, its ally in the ruling coalition.